When you have guests over for the first time, it’s best to make an impression right away. A nice introduction to the rest of your home is to have a custom set of cabinets near the entryway. One of the things you can work into your front space is a Tall Closet. 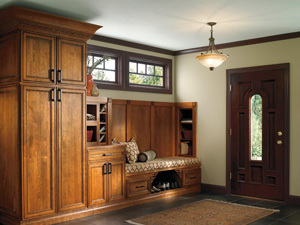 A nice floor-to-ceiling closet can be used for quick storage going in and out of your house. A nice way of organizing it would be keeping your bags and umbrellas up top, your coats and sweaters on the middle rack, and on the bottom you have some space for your shoes. When it’s not in use, the door is closed and everything is out of way, leaving your front door space clear for usage. Another nice addition to install by your front door is a seating area. No more squatting or kneeling down to put one’s shoes on when your leaving to go somewhere. Your older guests will especially appreciate this relatively easy modification to a once plain-looking entryway cabinet system. Regardless of how big your space is, an experienced cabinet maker can accommodate any need or preference when it comes to customizing your home. A place for sports equipment, Individual areas for each of your children, or a little nook under it all for the dog to sleep in: the possibilities with entryway cabinetry are great. So get planning, and be sure to call ASA when you’re ready to get your project going!